These are all signs of that perfectionism. Perfectionists set impossibly high standards for themselves (and others), which leads to frustration, disappointment, and exhaustion. The bottom line is that perfectionism is hugely stressful and makes us feel worse about ourselves. We can strive for and achieve and hustle relentlessly, but it will never be enough because we can never meet our unrealistic expectations. 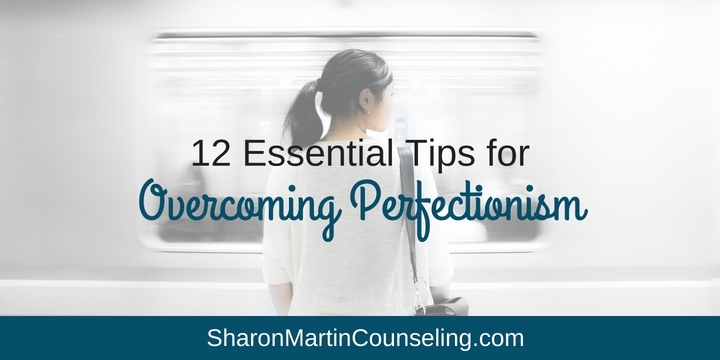 Of course, once you’ve decided to lay aside your perfectionism, it isn’t an easy undertaking. Your perfectionist thinking is probably well entrenched. So, I want to share 12 ways to let go of perfectionism and be kinder to yourself. 1) Instead of constantly feeling disappointed, set more realistic expectations. As perfectionists, we set ridiculously high standards and unrealistic expectations for ourselves and others. And because these expectations are impossible to meet, we’re constantly disappointed and frustrated. I know the idea of lowering your expectations can be hard to accept, but it does lead to greater happiness and more satisfying relationships. We ultimately have to realize that we’re expecting the impossible from ourselves and we can’t control and force others to meet our unreasonable expectations. So, if you’re continually disappointed and upset with yourself or others, it’s an opportunity to reassess and set realistic expectations – ones that you and others can reasonably meet. 2) Instead of criticizing yourself, practice self-compassion. Perfectionists are notoriously intolerant of flaws and shortcomings, so we tend to be very hard on ourselves. But self-criticism is both undeserved and unhelpful. Everyone struggles and is imperfect. We all make mistakes and feel inadequate sometimes. Kindness motivates us to do better, whereas criticizing and shaming tends to be demotivating. Try to give yourself the same compassion that you would show to a friend or family member – a kind word, a treat, or an uplifting message when you’re feeling down. 3) Instead of seeing mistakes as failures, adopt a growth mindset. When we have an attitude of growth, we choose to see mistakes as a normal and helpful part of the learning process. The only way to improve at something is to try, fail, and try some more. Instead of trying to avoid mistakes and failures, reframe them as normal and an essential part of your growth. 4) Instead of defining yourself by your accomplishments, focus on your character. Perfectionists tend to define themselves and their worth by their accomplishments. This leaves us always pushing ourselves to do more, be more, and prove ourselves. Accomplishments certainly have their place, but you’re so much more than a Harvard graduate, best-selling author, volunteer of the year, or any other title or accomplishment. Your value as a person isn’t dependent on being the best or earning it. You are worthy because of who you are, not what you’ve accomplished. Focusing on your good qualities, values, and strengths will help you reclaim your self-worth. 5) Instead of focusing on the outcome, enjoy the process. Perfectionists measure success and self-worth by their achievements, but when we put so much emphasis on the outcome, we sometimes miss out on enjoying the process. Try doing things for the experience, for fun, or because you’ve always wanted to try them, not because you’re good at them or to please others. Focusing on the process takes the pressure away from the results. It’s not just about whether you win, or get a promotion, or are praised. Some things are worth doing, even if the outcome is imperfect. 6) Instead of trying to please everyone, be true to yourself. When you focus on pleasing others, you disconnect from your authentic self. You start living your life to please others (for the “gold stars” and accolades) or to avoid conflict. This means everyone else’s needs and wants come first and you minimize your needs, wants, and values. Maybe you became a doctor to make your parents happy or you invited your mother-in-law to live with you because that’s what your husband wanted or you agreed to be chair of the committee because you didn’t want to disappoint your mentor. People-pleasing is not only tiring and unrealistic, it isn’t honest and true. So, you may be making others happy, but their approval can’t quiet your self-doubt and anxiety because they still don’t know the real you. When you express more of who you are and what you need, some people may be displeased; practice tolerating this because the alternative is to lose yourself and live as if everyone else is more important than you. 7) Instead of putting your needs last, be more assertive. 8) Instead of rigid, perfectionist thinking, challenge your negative thoughts. 9) Instead of overworking, do some things imperfectly. When we expect ourselves to do everything flawlessly, we’re treating all of our tasks with the same importance. In reality, not everything needs to be done perfectly. Some things – like cleaning your kitchen or eating healthfully – don’t have to be done perfectly in order for them to have value. Try leaving something undone or done imperfectly. It will feel uncomfortable at first, but it will get easier to tolerate and you’ll discover that nothing terrible happens when things are imperfect. This will free up mental and physical energy for the things that matter most. 10) Instead of comparing yourself to others, know your worth. We all know that comparing ourselves to others makes us feel worse, not better about ourselves. As a result of growing up in a competitive world, we internalize feelings of not being “as good as” or “not having enough”. We compare ourselves to others looking to see how we measure up. The problem is that comparison only works to validate our fears and self-doubts. And these comparisons are never fair because we don’t have all the facts about anyone else’s life; we only see the “airbrushed version” that they want us to see. 11) Instead of focusing on others, get to know yourself. 12) Instead of being ashamed of your flaws, love your imperfect self. Overcoming perfectionism is definitely a process and I hope these twelve tips to overcome perfectionism will help you get started. 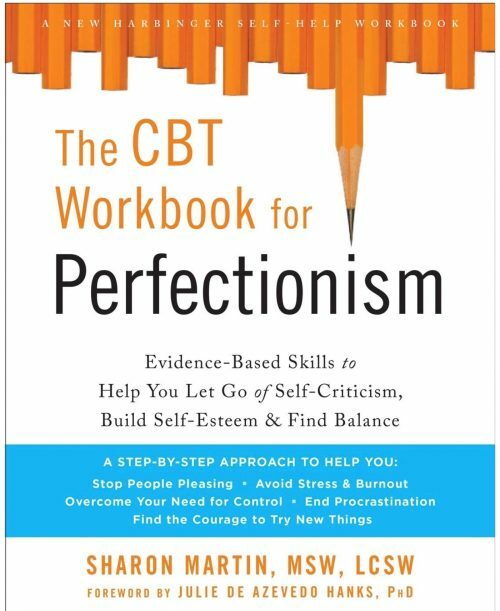 You can find an easy to print PDF of these tips for overcoming perfectionism, in my resource library – just sign-up below for access! 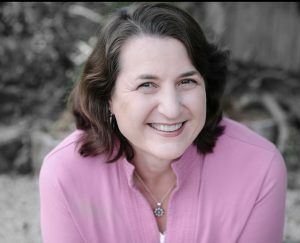 This article was originally published on PsychCentral.com. ©2018 Sharon Martin, LCSW. All rights reserved.